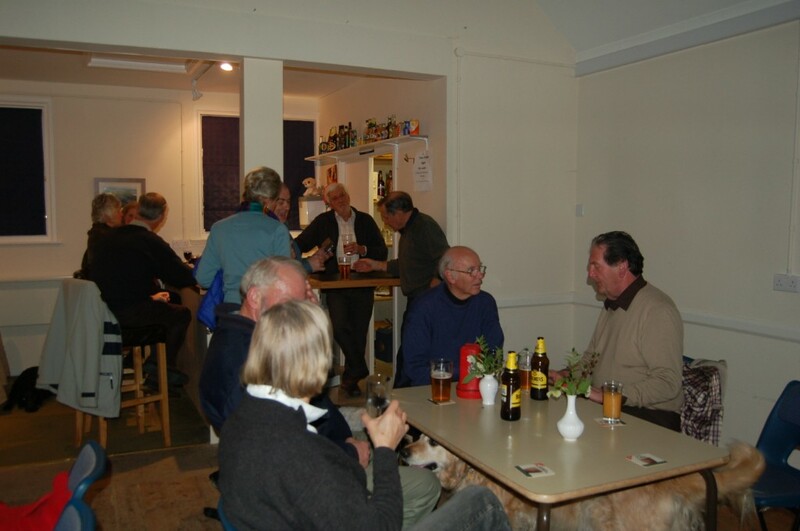 Pubs Nights happen every Friday evening in the village hall, with a fish and chip supper on the last Friday of every month. 7.30pm to 10.30pm. This is a popular, friendly evening to sit and chat with newcomers and friends. Our Pub Licensee and Bar Organiser, Tim Phipers, has a loyal team of volunteers from our Village organised for Bar Stewardarding on a rota system. Local beers and a selection of wines, spirits and soft drinks are available at very reasonable prices. A Pool Table and Table Tennis Table are there for those wanting some competition or just for fun. On Fish and Chip nights, Fish and Chips are collected from a local Fish and Chip Shop to order. Watch our “A Board” outside the Village Hall for the telephone number of the person organising and please ring with you requirements by 5pm latest on the Fish Night Friday. Considered Discussions, David Brundrett states his case to Licensee and Bar Organiser, Tim Phipers! Photographer Maureen Round.